In some situations it is useful to group actions together. 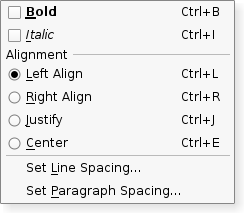 For example, if you have a Left Align action, a Right Align action, a Justify action, and a Center action, only one of these actions should be active at any one time. One simple way of achieving this is to group the actions together in an action group. Here we create a new action group. Since the action group is exclusive by default, only one of the actions in the group is checked at any one time. A QActionGroup emits an triggered() signal when one of its actions is chosen. Each action in an action group emits its triggered() signal as usual. As stated above, an action group is exclusive by default; it ensures that only one checkable action is active at any one time. If you want to group checkable actions without making them exclusive, you can turn of exclusiveness by calling setExclusive(false). Actions can be added to an action group using addAction(), but it is usually more convenient to specify a group when creating actions; this ensures that actions are automatically created with a parent. Actions can be visually separated from each other by adding a separator action to the group; create an action and use QAction's setSeparator() function to make it considered a separator. Action groups are added to widgets with the QWidget::addActions() function. This property holds whether the action group is enabled. Each action in the group will be enabled or disabled unless it has been explicitly disabled. This property holds whether the action group does exclusive checking. If exclusive is true, only one checkable action in the action group can ever be active at any time. If the user chooses another checkable action in the group, the one they chose becomes active and the one that was active becomes inactive. This property holds whether the action group is visible. Each action in the action group will match the visible state of this group unless it has been explicitly hidden. Constructs an action group for the parent object. Returns the list of this groups's actions. This may be empty. Adds the action to this group, and returns it. Normally an action is added to a group by creating it with the group as its parent, so this function is not usually used. Creates and returns an action with text. The newly created action is a child of this action group. Creates and returns an action with text and an icon. The newly created action is a child of this action group. Returns the currently checked action in the group, or 0 if none are checked. This signal is emitted when the given action in the action group is highlighted by the user; for example, when the user pauses with the cursor over a menu option, toolbar button, or presses an action's shortcut key combination. Removes the action from this group. The action will have no parent as a result. This is a convenience function for the enabled property, that is useful for signals--slots connections. If b is true the action group is disabled; otherwise it is enabled. This signal is emitted when the given action in the action group is activated by the user; for example, when the user clicks a menu option, toolbar button, or presses an action's shortcut key combination. Connect to this signal for command actions.